ATV MIGHTY TITE tie down system for your Quad or UTV! TheATVSuperStore.com Mighty Tite tie down system. Perfect UTV Tie Down System & ATV Tie Down System. Secure you UTV or ATV in seconds! Over 1300 units sold and counting! Check out our videos below for more information! Strapping down an ATV or UTV to your trailer can sometimes become tedious work. Ratchet straps can break, get clogged with mud, rust and become lost or misplaced. Additionally, to tie down your ATV or UTV after all day in the mud is messy and probably the last thing you really want to do. Finally, there is the security issue of tie down straps. Typically to tie down your ATV your trailer to prevent theft required a special chain or cable that was capable of locking. This is now a thing of the past! The quick release ATV tie down system that will allow you to literally securely and safely tie down your ATV or UTV on your trailer or tie down in your truck bed literally in seconds with very minimal hassle. The Mighty Tite Tie Down System Installation is easy & the system comes with all the necessary tie down mounting hardware. With a little pressure on the tie down rear tension assembly, and the included locking pin inserted, it presented a solid setup that took less that 1 minute to secure. This tie down system will fit up to a 32 x 11 tire. Other positive and important attributes of the tie down setup is no more damage to the frame or rack paint from old tie down ratchet straps. Here are some features of the system. Eliminates using Muddy, Tangled Ratchet straps! Won't Damage your UTV or ATV. Cages front tires and tensions rear axle or trailer receiver. Prevents accidental damage to pickup truck rear window and/or tool box. Floor plates mount to trailer/truck bed with carriage bolts and tie down system System is removable in seconds. Chrome plated locking pin with keyed lock to detour theft. Allows you to tie down your ATV in seconds for getting to the fun faster. Floor Slide-in Mounts install in approximately 10 to 15 minutes. 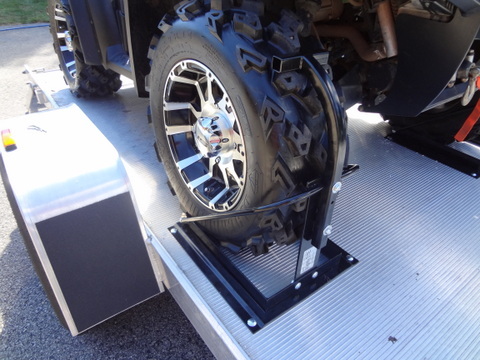 Tie down system quickly secures your ATV to your trailer or truck bed. Easy release for quick loading and unloading. Our ATV Quick Release system is designed for trailers or pickup truck applications. It easily installs onto most trailers and trucks utilizing carriage bolts. Trailers using metal mesh flooring may need to be reinforced for proper installation. Once in place you can tie down your ATV in seconds by stepping on a peddle and inserting a keyed locking pin. This system doesn’t use any ratchet straps and eliminates the tangle and trouble by using all metal components. The entire system is Powder Coated for a long lasting trouble free finish. The trailer tie down system secures your ATV by caging the wheels not the suspension or carrying racks, thus causing no harm to your ATV. When used properly, the tie down system will not loosen up, and has only two moving parts. All it takes is a step on a lever and inserting a locking pin and your ready to travel. To release, Step on the lever and remove the pin and your ready to ride. While many may hold their nose up at me for getting away from the traditional ratcheting straps to fasten their ATV’s and UTV’s down, why waste your time using straps for a ATV tie down, constantly checking the tension during long hauls, and the ability to be able to rest knowing your ATV is safe and secure! It is extremely great to be able to have a ATV loaded onto the trailer and ready to go in a moments notice. Quality durable materials, coupled with quality American workmanship means your ATV tie down system will last for years to come. Why spend hard earned money constantly replacing tie down straps that can wear out and break? With the ATV Superstore tie down system, you can be assured of long life, ease of use, and durability. You may spend a little more upon purchase of the ATV tie down system, but over the years you will realize a savings on traditional strapping equipment. You will save time and work loading and unloading your ATVs & UTVs with our M ighty tite tie down system. Tie-Down your UTV in seconds! Shown mounted to rear with a optional winch hook . Check out our Product Testing page for more information! Perfect for enclosed trailers also! More then one toy? Add optional extra floor plates for different configurations. Customer pictures of our Mighty Tite after a accident! ATV Tie Down System for tires 24 TO 32 inch. Feedback from some of our happy customers who use our strapless tie-down system. Over 1300+ units sold! . Highly recommend this tie down system! I have installed the tie down system in an enclosed trailer. It took me less than an hour to bolt in place and it works perfectly. It takes me less than a minute to load and unload my Ranger and when it is in tow it is rock solid. I also like the fact that it does not stress out the suspension on my Ranger. I would highly recommend this tie down system for anyone wanting to make a hunting or camping trip easier. Especially someone like myself who is getting up there in age and looking to make each trip less of a hassle so I can keep doing it for many years to come. Thank you so much for not only getting my order to me ASAP, but also for finding the error I made and correcting it for me. I know where I will be spending my money the next time I need something for my ATV. Thanks is just so inappropriate, I would have had to cancel my vacation had you not seen my mistake. The offer stands-IF you are ever down this way, I owe you at least a steak dinner and a six pack. FYI-The system was a snap to install, and works perfect! Even the wife was impressed and that isn't something that comes easy-Trust ME! Hi Guys-All I can say about the tie down system I got from you is -WOW!!! A totally bullet proof-idiot proof way to tie down your quad in a minimum amount of hassle free time. Drive the quad into the wheel chocks, hook the chain to the ball fixture, step on the pedal, insert safety pin and BAM, your ready to rock. In less time than I just explained it. No messy mud covered straps. No muss-no fuss, even a little kid can do it. Don't believe me watch the video! Something I really like is, I can slide the wheel chocks and chain tie down off and have an empty trailer to haul my Hog or whatever else I want to haul in the back. I had nightmares about my quad coming loose and ending up in the middle of the road-or worse, causing a wreck. Not going to happen with this system. I took my quad up to Minocqua, Wisconsin last January, and managed to slide off the road in a white out blizzard. Couldn't get the trailer door open and figured by the time the tow tuck got me pulled out the quad would be laying on it's side. NOT! It was still firmly tied down-didn't move an inch. I doubt the system was designed for something like that, but I am here to tell you the system works! And here is the kicker. After talking to Thor about which specific system I needed, somehow (I think my wife did it*:D big grin) ordered the wrong system. 5 minutes later Thor is shooting me an email letting me know he checked my order-BEFORE IT WAS SHIPPED-and noticed I had the wrong order number and corrected it for me. Anyplace else would have shipped the item, I would have had to ship it back and pay extra shipping charges. I won't ever forget Thor and please let him know I have a case of cold Funweisers setting in the fridge with his name on it! Once again Thank You from a very happy customer. I purchased two of these ATVSuperStore tie down kits for our 2 Polaris Sportmans. All I can say is WOW! They are so easy to use. Just drive your quad into the cage and then connect the rear arm chain to your hitch and push it down with your foot. That's it! I can have both our ATV's ready to trailer in no time at all. I also like how you can remove the pieces to use the trailer for other needs. No tools needed. Just slide them out of the mounting plates. This is by far the best way to secure your toy in no time at all.